MP4 Video Converter for Mac is an excellent Mac MP4 converter software which can convert all video formats such as 3GP, FLV, MPEG, MOV, VOB, WMV, AVI to MP4 video and AAC M4A audio with excellent output quality and high conversion speed. 3GP MP4 Video Converter for Mac can convert all sorts of regular video formats to MP4 for MP4 video players such as iPhone, iPod, Apple TV, video mobile and PSP. This powerful Mac video to MP4 converter provides you with versatile features such as batch conversion, setting video brightness, contrast, saturation, video crop, video trim, and joining multiple files into one file. Convert your videos to iPhone, iPod, Apple TV and PSP on Mac OS X with MP4 Video Converter for Mac and enjoy your digital life! 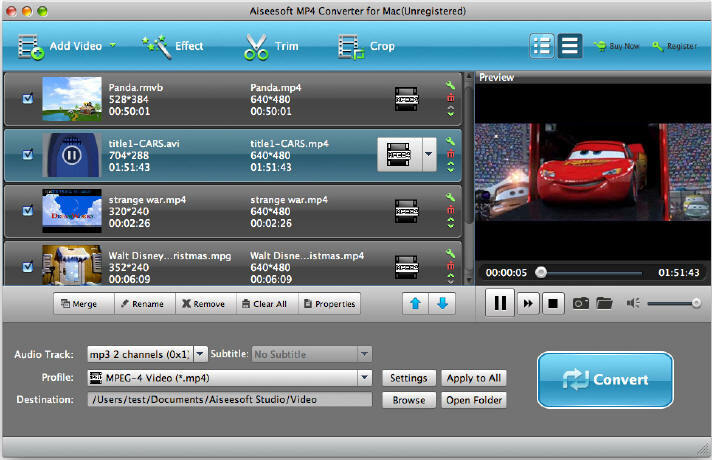 A professional mac mp4 converter developed only for Mac OS users. Support MOV, 3GP, AVI, MPEG and FLV and so on. This MP4 Video Converter for Mac supports outputting MP4 videos for iPhone, iPod, Apple TV, PSP and other mp4 players. Trim your video files to only convert a part of a video file. Crop video to remove black video sides to enjoy the joy of full screen. Using this mac mp4 converter, you can capture pictures by clicking the snapshot button while previewing the movie. With MP4 Video Converter for Mac, you can convert video to MP4 for Pod, iPhone, Apple TV and PSP with just a few clickss. Why Choose MP4 Video Converter for Mac?